On a windy Saturday afternoon in August, the founder of Habeetats André Amtoft entered the main tent in Upsala Park in St. Petersburg. The day was dedicated to ecology and sustainable ways of life and with that as his point of departure Danish sociologist and visual artist Amtoft had a remarkable story to tell. Together with his sister Anja Amtoft Wynns, a biologist and solitary bee expert, and art director Hans Peter Blichfeldt Dinesen, Amtoft creates so called Habeetats nesting shelters for solitary bees. 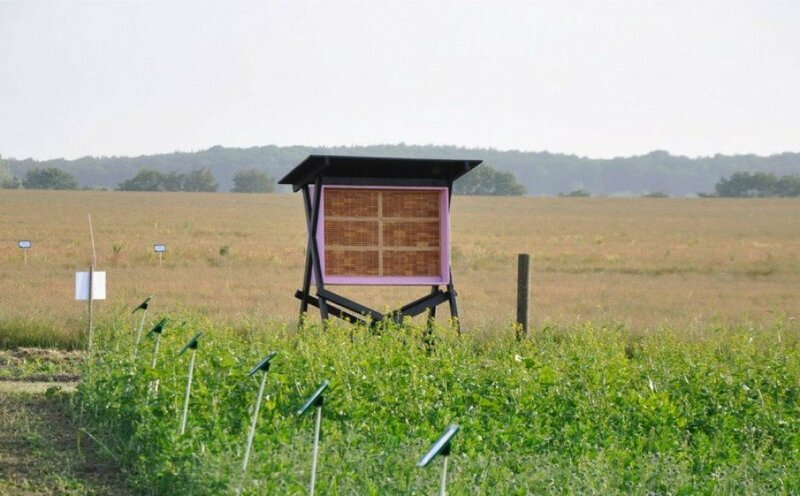 Over the past years, the need for these nesting shelters has become evident due to a decline in the population of the more well-known honey bees. The declining population is caused by Colony Collapse Disorder, or CCD, a phenomenon probably unknown to most laypersons not educated within the field of bees. CCD occurs when a large amount of worker bees suddenly disappears leaving the queen bee behind. The disappearance of the worker bees has a vast impact on the surrounding environment affecting the ability of plants and agricultural crops to reproduce. This creates a problem not only for local, green areas but for food production worldwide. According to UN estimates from 2010, 71 of the 100 crop species responsible for providing 90% of food across the world are dependent on bee pollination. In other words, the decline in honey bees and the changes in pollination are matters affecting all of us. 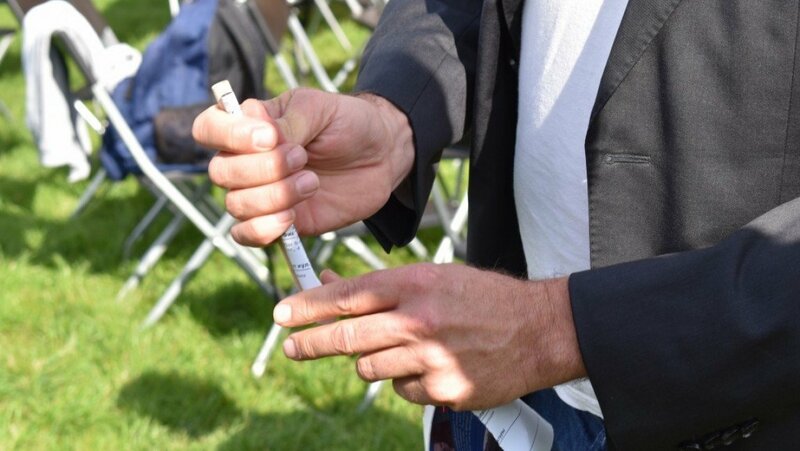 As Amtoft talked to the group of people who had gathered in the big, blue tent in Upsala Park, it became clear that Habeetats for that exact reason is made for everyone to be part of it. By focusing our attention on solitary bees we have, according to Amtoft, a rich source to sustainable pollination. 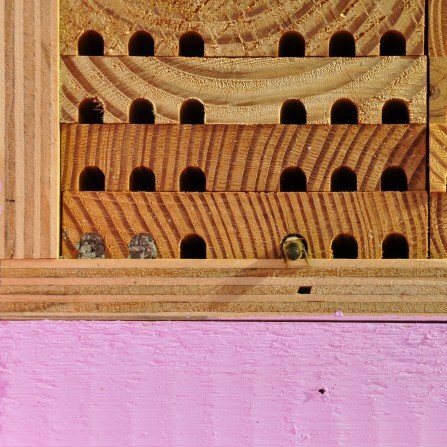 Solitary bees are a seemingly modern crowd favoring equal rights and strong, independent females. In contrast to the traditional honey bees, solitary bees do not have queens and workers and every female bee is fertile and able to make her own nest. Moreover, solitary bees are unaffected by the CCD and even though they do not produce honey they are excellent pollinators – in some instances even better than honey bees. In Amtoft’s studio in central Copenhagen he therefore came up with the idea of locally produced, handcrafted nesting shelters made from Dinesen Douglas Fir from Dinesen’s sawmill leftovers. The shelters are developed in collaboration with architect Jeppe Utzon and field tested by Anja Wynns herself and provide the solitary bees with much needed, undisturbed nesting space in floral areas. 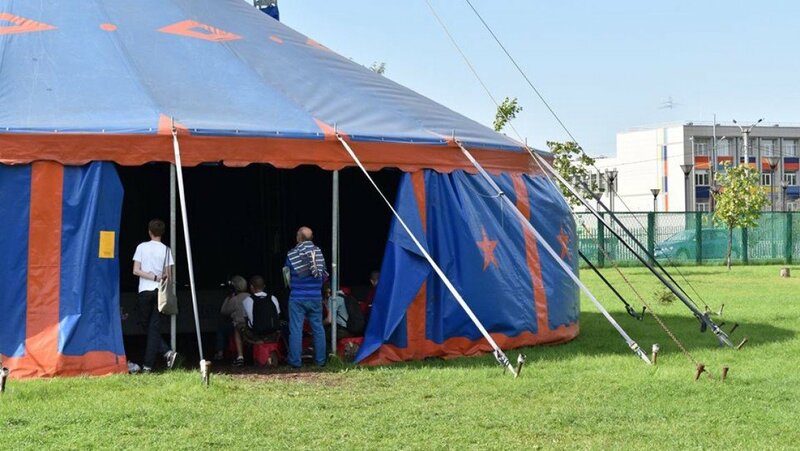 In this part of the project the audience in the blue tent have an important role to play along with numerous others from St. Petersburg to Denmark. To help give the solitary bees the best living conditions one can acquire Habeetats’ design shelters or simply built one on ones own. In Upsala Park Amtoft showed both children and adults how the nesting shelters were easily constructed by rolling pieces of paper into small pipes and collecting them in a larger container to be attached on the outside of a house. Though André Amtoft has now returned to Denmark his talk on strong, solitary bees and sustainable pollination still seems to flutter around in Petersburg. And who knows, maybe we will soon get to see homemade nesting shelters hanging from the Russian dachas. Alongside the Danish contributions a number of EUNIC members, including the Goethe-Institute, The Finnish Institute, the French Institute and the Norwegian Consulate, arranged film screenings and creative workshops to promote sustainability. 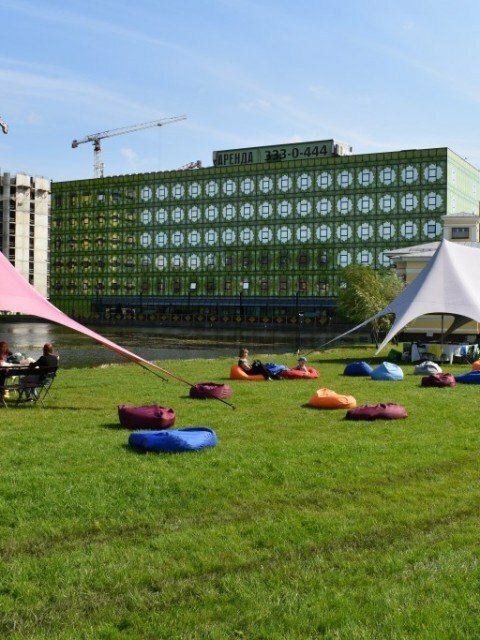 The various events included sorting of waste, redesigning of recycled clothes, and a Nordic walk, all of which sought to influence the mindset of the visitors and offer them new perspectives on green solutions and organic ways of life.